"Don't Speak" mask is truly not just a mask, but how I can keep it classified. If you really follow my work, you know that I have great reach in a variety of materials. I love creating, have a creative mind, love teaching, am a technician, and want to learn something new every day. So experimenting is vital. 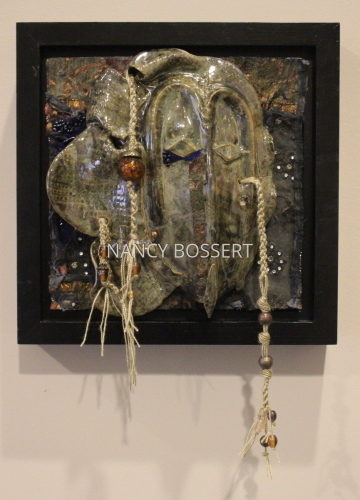 I do have a blog: nancybossert.blogspot.com where I try to explain how I create, but this blog also takes time to keep up with. I am always available to answer questions, teach privately, group classes and online classes. Now to the mask. I own a kiln and do a nice amount of stoneware work. The cost of shipping stoneware and sculpture, well, let's say, I just find it easier to sell in brick and mortar locations and avoid that aspect. Follow me on pinterest for some of my clay posts or FB. The Don't Speak mask is a stoneware, high fire, hand built piece. this would be classified as a mixed media, relief, since it cannot be viewed from all sides. The mask is attached to and 8" x 8" wood surface canvas that I painted black with acrylic paint, then collage with rich fabric. I also framed this in a black wood floater frame which is wired for hanging. The outer dimension of this frame is 10.25" x 10.25" and the mask projects approximately 4" from the wall. The one longest drop of cord extends below the frame approximately 3". This was created on a curve so that the mask does not lay flat, It incorporates print and smooth areas with circular opening for a mouth. The glaze is a combination of rich blue, tan and brown revealing all the clay impressions. I then used a durable waxed cord in tan to create my macrame additions. Wood, fabric and some beadwork elements to add to the compositional balance. Funny how macrame has made such a come back, I have made sure to incorporate that into my teaching throughout the past 30 plus years. Also added one photo of my new dishware, all one of a kind, individually painted, goldfish and koi. "Midnight Star Mask" is truly not just a mask, but how can it be classified. If you really follow my work, you know that I have great reach in a variety of materials. I love creating, have a creative mind, love teaching, am a technician, and want to learn something new every day. So experimenting is vital. 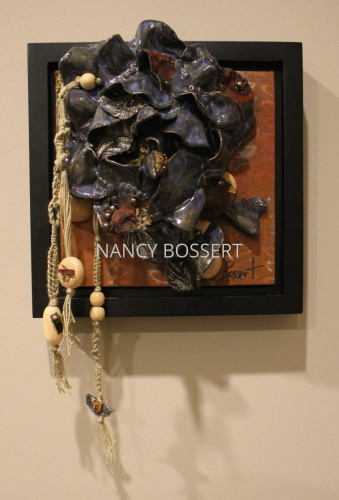 I do have a blog: nancybossert.blogspot.com where I try to explain how I create, but this blog also takes time to keep up with. I am always available to answer questions and teach privately, group classes and online classes. The Midnight Star mask is a stoneware, high fire, hand built piece. this would be classified as a mixed media, relief, since it cannot be viewed from all sides. The mask is attached to and 8" x 8" wood surface canvas that is collages , painted and drawn on. This is also framed in a black wood floater frame which is wired for hanging. The outer dimension of this frame is 10.25" x 10.25" and the mask projects approximately 3 1/2" from the wall. The one longest drop of cord extends below the frame approximately 1/2" . This was created on a curve so that the mask does not lay flat, It incorporates decorative relief designs in what might be interpreted as a tribal like pattern . The glaze is a deep rich prussian blue and browns revealing all the clay impression grooves. I then used a sienna hued waxed cord to add additional textural element in macrame. Added wood,metal and clay birds to complete my composition. Also added one photo of my new dishware, all one of a kind, individually painted, goldfish, koi, cats and nudes. "My Soil Mask" is truly not just a mask, but how I can keep it classified. This is one of a 12 mask series. If you really follow my work, you know that I have great reach in a variety of materials. I love creating, have a creative mind, love teaching, am a technician, and want to learn something new every day. So experimenting is vital. The My Soil mask is a stoneware, high fire, hand built piece. this would be classified as a mixed media, relief, since it cannot be viewed from all sides. 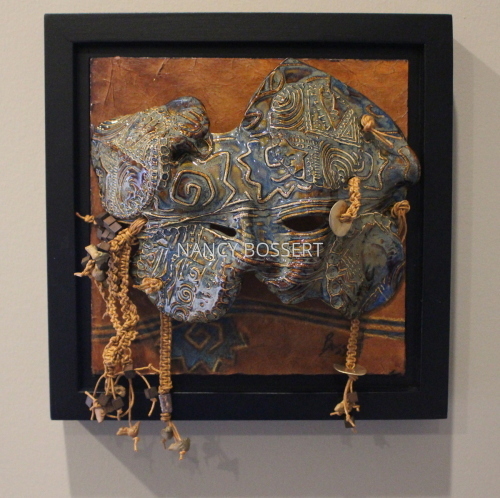 The mask is attached to and 8" x 8" wood canvas that collaged with a textile that has been enhanced. I also framed this in a black wood floater frame which is wired for hanging. the outer dimension of this frame is 10.25" x 10.25" and the mask projects approximately 3.3" from the wall. The one drop of cord extends below the frame approximately 4" another cord approximately 1" below the frame. This was created on a curve so that the mask does not lay flat, It incorporated a small grid pattern in tactile texture. The glaze is a tonal varied moss green , revealing all the clay impressions. I then used a durable crochet thread in a tan coloration. Used the crochet thread for wrap work and macrame. And in the process added glass and metal bead work. "Gingko Mask" is truly not just a mask, but how I can keep it classified. If you really follow my work, you know that I have great reach in a variety of materials. I love creating, have a creative mind, love teaching, am a technician, and want to learn something new every day. So experimenting is vital. The Gingko mask is a stoneware, high fire, hand built piece. this would be classified as a mixed media, relief, since it cannot be viewed from all sides. The masked is attached to and 8" x 8" wood canvas that collaged and then painted with acrylic paint. I also framed this in a black wood floater frame which is wired for hanging. the outer dimension of this frame is 10.25" x 10.25" and the mask projects approximately 6" from the wall. The one drop of cord extends below the frame approximately 4.5" another cord approximately 1 .5" below and the third is approximately .5 below the bottom of the frame. This was created on a curve so that the mask does not lay flat, It incorporated leaf prints and tribal images. The glaze is a deep rich prussian blue , revealing all the clay impression from the gingko leaves . I then used a durable crochet thread, my preference would have been a waxed cord, but loved this color. Used the crochet thread for wrap work and macrame. Added wood and fabric elements to balance my composition to the macrame and to the canvas surface. 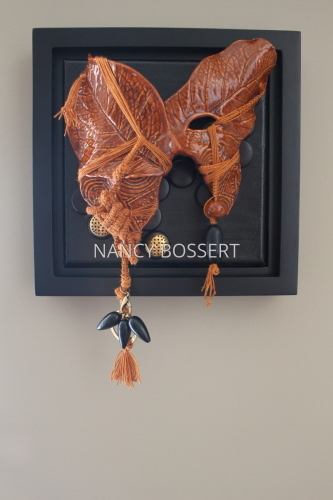 "Butterfly Mask" is truly not just a butterfly mask, but how I can keep it classified. If you really follow my work, you know that I have great reach in a variety of materials. I love creating, have a creative mind, love teaching, am a technician, and want to learn something new every day. So experimenting is vital. 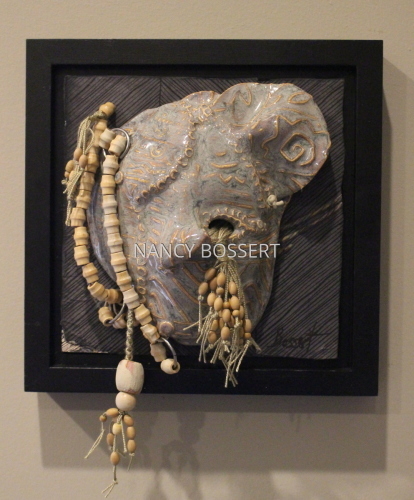 The Butterfly mask is a stoneware, high fire, hand built piece. this would be classified as a mixed media, relief, since it cannot be viewed from all sides. The masked is attached to and 8" x 8" stretched canvas that I painted black with acrylic paint. I also framed this in a black wood floater frame which is wired for hanging. the outer dimension of this frame is 10.25" x 10.25" and the mask projects approximately 4" from the wall. The one drop of cord extends below the frame approximately 2" the other cord is almost even with the bottom of the frame. This was created on a curve so that the mask does not lay flat, It incorporated leaf prints and tribal images. The glaze is a deep rich rust, revealing all the clay impression grooves. I then used a durable crochet thread, my preference would have been a waxed cord, but loved this color. Used the crochet thread for wrap work and macrame. Added wood and metal elements to balance my composition to the macrame and to the canvas surface. "Weeping Wood Mask" is truly not just a mask, but how can it be classified? If you really follow my work, you know that I have great reach in a variety of materials. I love creating, have a creative mind, love teaching, am a technician, and want to learn something new every day. So experimenting is vital. 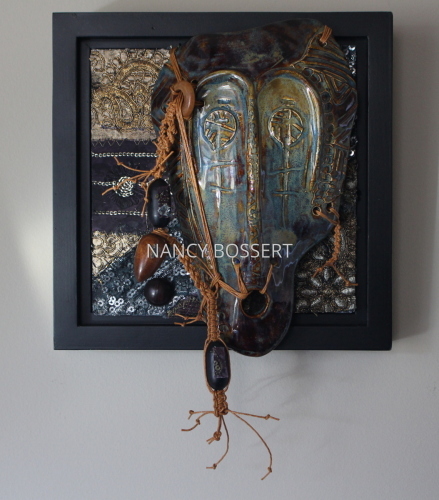 The Weeping Wood mask is a stoneware, high fire, hand built piece. this would be classified as a mixed media, relief, since it cannot be viewed from all sides. The mask is attached to and 8" x 8" wood surface canvas that is collaged, painted and drawn on. This is also framed in a black wood floater frame which is wired for hanging. The outer dimension of this frame is 10.25" x 10.25" and the mask projects approximately 4" from the wall. The one longest drop of cord extends below the frame approximately 2 1/4" . This was created on a curve so that the mask does not lay flat, It incorporates decorative relief designs in what might be interpreted as a tribal pattern . The glaze is a lighter blue/gray and the high areas of pattern is more brown/tan. I then used light khaki threading for additional texture. Adding numerous wood beads and macrame and some metal rings. New With Words Series: "Cutting Zippers" Stoneware pot. This pot is hand made, where texture is important and words/phrases are included. Enjoy the earth quality and the harmony the glaze brings to the hand work. This pot measures approximately 11" in height and at it's widest is 5" across. sizes are approximate since hand built. Enjoy alone or in a grouping. 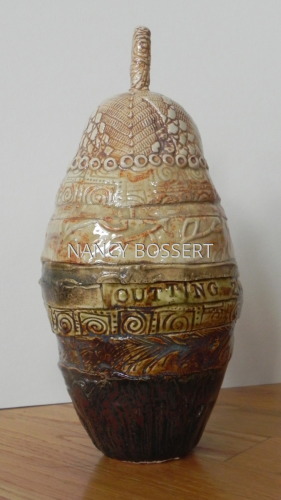 New With Words Series: "Afraid of the Corner" Stoneware pot. This pot is hand made, where texture is important and words/phrases are included. Enjoy the earth quality and the harmony the glaze brings to the hand work. 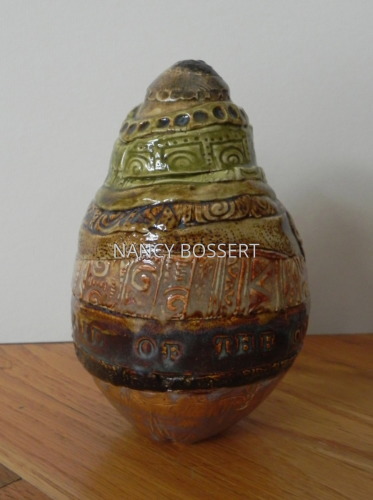 This pot measures approximately 7" in height and at it's widest is 4" across. 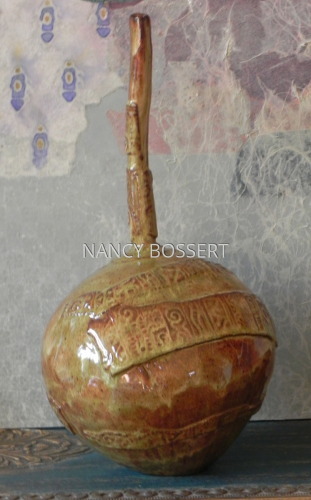 "Golden Neck" ( part of my long neck or Flute series) is a hand made, stoneware, clay vessel. The coloration has really been difficult to capture. It takes on many different hues. The coloration is a rich golden ochers with an underlying theme of rust brown with speckles and variations. The stem or neck is thin and curved. This piece is not meant to hold water, but a dry flower element could be placed in the neck opening. This is a decorative stoneware piece. I stands approximately 13 1/2" high and is approximately 6" wide. The neck is approximately 6 1/2" in length. This is a gloss glaze. 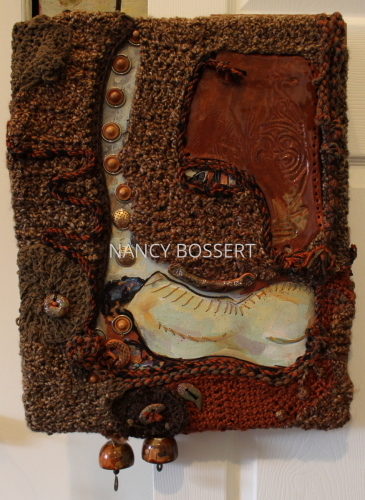 I was asked by a gallery if I could do a few more fiber art pieces. This is a smaller one that I just did. There is a lot of materials in this, but not confusing. I crocheted sections, I made roping out of numerous combinations of fibers. And this piece slowly took shape. Adding my own handmade stoneware buttons and wood accents to create the composition. I added two of my stoneware (actually I use them as stoneware shot cups) cups and made them into bells instead to drop from the bottom of the piece. Yes, there is much going on, but the coloration keeps the business under control. All the sewing really makes my fingers sore :). Probably the last thing I added in addition to the bells was the linen stitching on the figurative, acrylic painting. I always welcome questions and comments.